This exquisitely patterned silk kite scarf is cut in a diamond shape to form a neckerchief style. The cool vintage styling pairs brilliantly with simple t-shirts and knits or adds a quirky flash of colour to more formal tailoring. Wrap, sling or drape this must-have accessory however you like, its slinky-soft texture is a dream to wear. 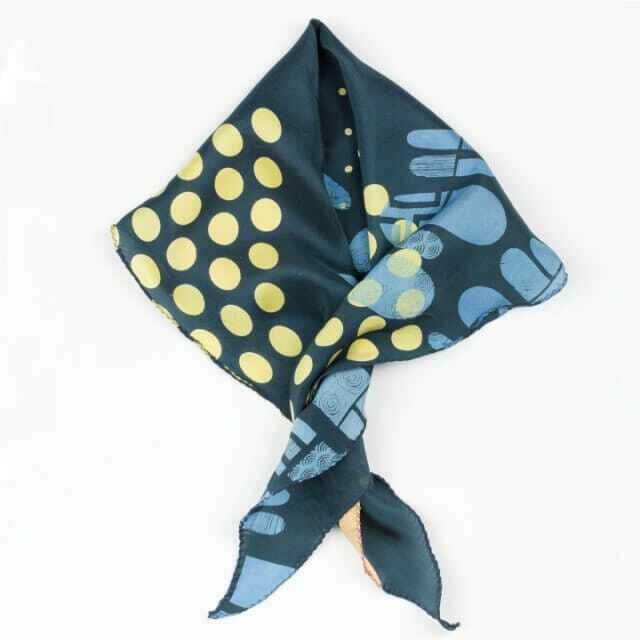 The scarf is made from Habotai, a shimmering lightweight silk which Fiona hand dyes and prints to create a warm ivy green background featuring her retro Japanese-inspired ‘Stripy Pods’ print delicately picked out in lemon yellow and pale blue. Feel free to treat yourself, we totally understand. Edinburgh designer Fiona McIntosh trained at the Scottish College of Textiles in Galashiels and established her own label 'Tessuti Scotland' in 1985 to produce unique and eye-catching wearable textiles. She regularly showcases her work at UK trade shows and annually exhibits at the popular NY NOW show in New York. 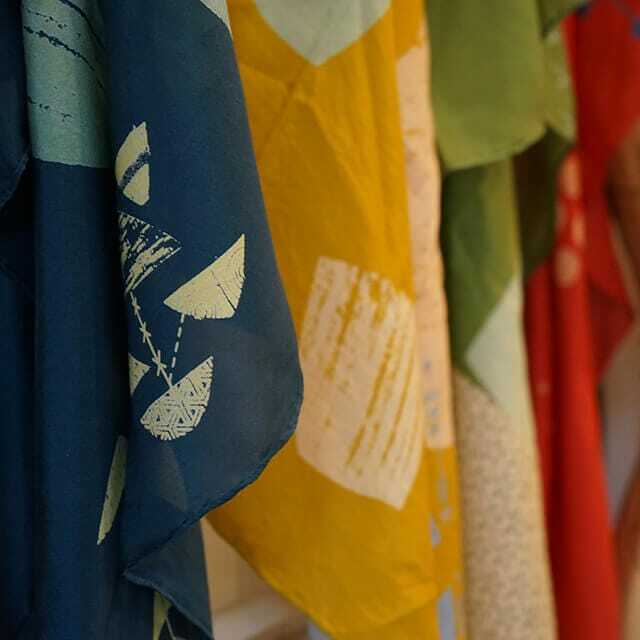 Fiona designs and produces hand dyed and hand silkscreen-printed fashion accessories using the discharge method of printing. A huge fan of the imagery, design and colours of the 1950s and 60s, Fiona draws inspiration from these eras to produce desirable collections of scarves, mufflers, wraps and arm warmers in silk, cashmere, wool/lycra and lambswool. Colour is king in her creations. The discharge print method of bleaching out a light pattern on a dark background allows her to produce richly hued designs on fabrics whilst retaining their original softness.